“It hurts when I try to undo my bra.” Or “Taking off my shirt is painful.” Or “Combing my hair hurts my shoulder.” Or “I have problems reaching behind my back.” These are common complaints for trigger points in the rotator cuff muscles, infraspinatus and subscapularis. There are 4 rotator cuff (RC) muscles that assist in movement at the shoulder (supraspinatus, infraspinatus, teres minor, and subscapularis). These muscles hold the head of the humerus in the glenoid cavity, as well as provide mobility. An imbalance in rotator cuff muscles can be painful, as well as severely limit the joint range of motion (ROM). That imbalance can also lead to trigger points that are painful when touched. for more effective, natural methods of relief. The function of the infraspinatus is to externally rotate the humerus. (It’s the kind of motion that allows you to bring your arm back to throw a ball.) The function of the subscapularis is to internally rotate the humerus. (This is the forward and downward motion of throwing a ball.) As you may know, these muscles are antagonists to one another. Each opposes the function of the other. This concept is important, because the health of one muscle will usually affect the health of the other. (It’s a yin-yang theory of balance.) Therefore, treatment of both the infraspinatus and subscapularis are imperative in a complete healing plan. The infraspinatus is located on the shoulder blade itself. The muscle above the spine of the scapula is called the supraspinatus (‘above the spine’), while the muscle below the scapula is called the infraspinatus (‘below the spine’). If one is flexible enough, he or she may be able to reach over their shoulder with the opposite hand and palpate the infraspinatus muscle. 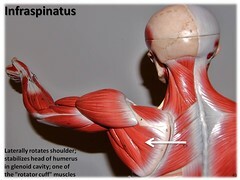 One of the key causes for tight infraspinatus muscle is holding the arms out in front for extended periods of time. Acupuncture and massage are two extremely effective methods for treating the infraspinatus trigger points. Stretching after each therapeutic treatment is important to help relax musculature and improve circulation. To treat the infraspinatus at home, while you are between your physical therapy, acupuncture, or massage treatments, invest in a tool to help you work out trigger points in the infraspinatus. August Point Wellness carries the Sciaticare Ball, an effective trigger point relieving tool for many different musculoskeletal trigger points. Instructions on how to use the Sciaticare Ball for infraspinatus can also be found on our website here. With the way most people use their shoulder, a strength imbalance causes the subscapularis to be strong, while the other three RC muscles are weak. Therefore, after the trigger points have been worked out of the RC group, one should begin strength training on these muscles. Exercises that isolate the individual RC muscles are a great start. Pair it up with exercises that stabilize the scapula and regain strength and flexibility in your shoulder! External Liniment/Rub – Sciaticare Penetrating Muscle Rub applied over muscles for faster healing and improved blood flow. Patient would apply Sciaticare PMR daily and massage into area to promote circulation and healing. Application of Sciaticare PMR before any rehabilitation exercises would be recommended as well. This type of frozen shoulder pain usually requires 4-6 treatments to really improve ROM and show results. Obviously, your results may differ. You may need to modify your posture, work ergonomics, and lifestyle as well. Thank you for reading my blog! It will get a revamp with more pictures and a nicer layout sometime in the future. At this point, there is just so much information in my head that needs to get out on paper that I don’t have the time to reorganize it!